British artist and musician. Born, London 1896. Died, Toronto 1959. Educated in Canada, and then from 1922 studied music at the Royal College of Music. While at Oxford she began making archaeological drawings under the direction of Sir Leonard Woolley. This led onto her working for Sir Alan Gardiner and the Egypt Exploration Society; she copied and subsequently published parts of the temple of Sethos I at Abydos. (a) Leica Kodachrom transparencies of reliefs from the interior of the Temple of Ramesses II at Abydos, in the possession of Miss Calverley. (b) 10 photographs of the ceiling of the Cenotaph of Sethos I at Abydos, in the possession of Miss Calverley. (c) 383 photographs made from Miss Calverley’s negatives for Sir Alan Gardiner. (d) Correspondence, in the possession of Miss Calverley’s niece, Mrs S. Rampen. (a) Given by Miss Calverley in 1950. (b) Given by Miss Calverley in 1956. (c) Presented by Sir Alan Gardiner. (d) Presented by Mrs S. Rampen in 1986. The slides have been arranged in order of B. Porter and R. L. B. Moss, <i>Topographical Bibliography of Ancient Egyptian Hieroglyphic Texts, Reliefs and Paintings</i>, vi (1939). Photographs are kept as received. The slides are originals. The photographs were made from Miss Calverley's negatives which at that time were kept at Chicago House. Slides formerly deposited with the School of Archaeology and Oriental Studies, University of Liverpool, then in the possession of Mrs S. Rampen in 1986. Gardiner MSS 36.18-24, seven boxes of transparencies - hieroglyphs from Temples of Sethos I and Ramesses II at Abydos, probably from Miss Calverley. Gardiner MSS 43, Abydos Enterprise. The material was used for reference whilst preparing the publication of the Temple of Sethos I at Abydos. 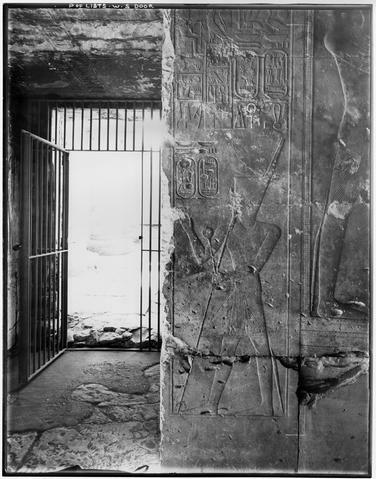 See A. M. Calverley, <i>The Temple of King Sethos I at Abydos</i>, i-iv (1933-1958).